Today, with increasing competition for the consumer's dollar, retailers like you face a tremendous Challenge of competing for each dollar against chain stores employing sophisticated methods in merchandising, advertising, buying leverage and store operations. At MTC, our goal is much more than delivering product to your store. We have a mutual interest in making your business grow and succeed. MTC is more than just your distributor -- it is your services-based organization ready to provide you with solutions to compete. Larger chains have a whole team of specialists to help each store become wildly profitable -- we're the specialists for the independent distributor. We've been in the business since 1921, and we have a full set of tools ready to take your business to the next level. We suggest that if you are a prospective customer, check out our Services page. It will provide you with a complete list of ideas that you can apply to your store. Although we pride ourselves on the services we can provide you, we also offer a massive selection of products that you can order. Our 150,000 square foot warehouse stores over 8,000 SKU's for you to order and stock in your store. This includes not only your standard tobacco and candy selection, but health & beauty aids, juices, water, sundies, even frozen foods and grocery items. So how do you get all of these great products into your store? With our efficient order process, you can order from Monday through Thursday and have your order picked and shipped for delivery the next day. With the addition of our new warehouse, we have implemented a warehouse management system. This means you get less out of stocks and a better, more accurate order every time you shop with MTC. The connection to MTC isn't just our products though -- it's our sales force. MTC, upon your discretion can have a salesperson call on you and place the order for you. We highly suggest this practice, because your salesperson is sent out each call day with a system that can provide you with critical information like top 20 selling products in each category; products that you may not have in your store, costing you dollars every business day. Included in the information exchange is our famously popular 'Quicksilver Messenger Service'. Quicksilver is delivered to your email or available on the web 24 hours a day. It contains the most recent, up to date information about the industry and about the status on products at MTC. Are we out of stock on a product? You'll know about it before you order it. If you opt out of having a salesperson call on you every week, we also offer direct Telxon ordering. 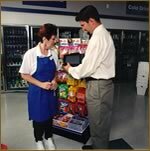 This allows you to schedule your employee to do an inventory of what you need to order and place the order yourself! Many of our customers want to receive their invoices and other information via EDI - Electronic Data Interchange. This lets them store information on their systems and create reports; even track inventory automatically. We offer EDI - ask us about it. This company wasn't built off delivering products to the masses-- it was built off a desire to offer services that no other distributor can match. We did it in 1921, and we still hold true to the promise that we can make a difference in your business. We're MTC - and we have a committment to your growth. For more information about MTC, email or contact us at (800) 669-6449. A friendly Customer Service representative will explain how you can start receiving the services and benefits we have to offer you.